The fuel pump circuit is fairly basic. 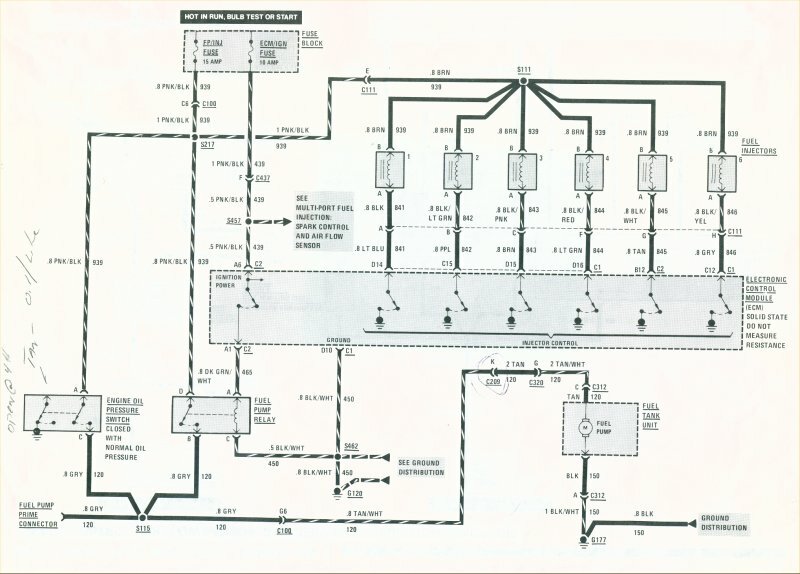 Note that when the key is first turned to start, the ecm sends a signal for approximately two seconds to the fuel pump relay which turns the pump on and pressurizes the fuel rail. The pump only runs for this approximate two seconds unless the engine has started. Therefore, it is normal to hear the pump run for a moment and then shut off. The oil pressure sender provides a back up to the fuel pump relay. When the oil pressure rises to four psi when the engine is being cranked, the contacts in one side of the sender close and send power to the pump. This allows the car to start even if the relay has failed although it will take more cranking before the pump is energized. Note that the oil pressure sender does not shut the pump off if the engine quits and oil pressure is lost even though many believe that it does (If the fuel pump relay is bad, then it would cut the pump off if the oil pressure dropped, but, as long as the relay is good, it will not). Also note that the fuel pump and the fuel injector harness are on the same fuse. If the fuel injector harness is burned by the EGR valve or is pinched and shorted by the injector rail/coil bracket, etc., the fuse will blow and the car will not start. The fuel pump test connector (gray wire just behind/below the alternator) may be used to activate the pump by supplying it with 12 volts. People often use this to drain the fuel tank by plugging the connector to the lead that goes to the underhood light, or, by touching it to the terminal on the back of the alternator where the battery feed cable attaches. Note, that the fuel pump test connector does not feed thru a fuse. Therefore, if one applies 12v to the connector, the pump should run. If it does not, it would seem to be a problem in the fuel pump, itself, or the wiring going to/from it. If the pump runs, go back and check the fuse and the relay on the passenger side inner fender. Aftermarket "hot wire" kits often trigger the new relay off the existing wiring. Therefore, if the pump works when the test connector is powered, then go back and look at the fuse in the fuse block and the original relay. 1. Check the fp/inj fuse in the fuse block. If it is blown, the most common two problems are shorts. Either in the wiring harness that goes down the front of the engine to the oil pressure sender by the pump, or in the injector harness around the egr valve or the coil mounting bracket where a wire has burned or been pinched so that it shorts out and blows the fuse. If you unplug the injector harness by the coil pack, and the fuse still blows, then the problem is most likely in the pink/black wire that goes to the oil pressure sender although it can be in the harness somewhere in route to the pump. If you unplug the harness in the trunk by the drivers side tail light and the fuse does not blow, then the pump may be shorted. If it does not blow with the fuel injector harness unplugged, then the problem may be in the fuel injector harness. 2. Touch the gray pump test connector to the battery post on the back of the alternator. If the pump runs, then you know the problem is probably in the fuel pump relay on the passenger side inner fender. If it does not, the problem is most likely at the pump end, or in the hot wire (relay or hot wire fuse) Then you can unplug the hot wire and return it to the original configuration to see if it now runs which would show the problem is in the hot wire. I would connect the gray wire to the alternator battery post and go to the hot wire relay to see if it is sending power to the pump. 3. If the problem appears to be on the factory relay end, unplug the connector from the factory relay, and check for voltage (key on) on the pink/black wire from the fp/inj fuse..if no voltage, then check the fuse. 4. If the pink/black wire has voltage, then rig a test light, or a volt meter to the dark green/white wire in the connector...while watching the lite, or the meter, turn the key on, and you should see voltage for two seconds before it goes away....this is the trigger from the ecm that initially powers the pump. 5. If you have power on the pink/black with the key on and power on the dark green/white wire for a couple of seconds when you turn the key on, and the pump ran when you touched the gray wire to the alternator battery stud, then it would seem the factory relay has given up the ghost.